Before commencing his official election campaign, Candidate Mahinda Rajapaksa flew to Andra Pradesh with an entourage of 56 (including soon-to-be Health Minister Tissa Attanayake), for a special pooja in the Tirumala Venkateshwara Temple. In his eagerness to win divine backing for his election campaign, not only did he become a temporary-vegetarian; he reportedly ordered the entire Sri Lanka flight to follow suit: “There were strict orders to the Sri Lanka Airlines special flight….to serve only vegetarian food on board”[i]. The absolute majority of Lankan politicians are superstitious. Many of them, including most of President Rajapaksa’s predecessors, would have visited various religious establishments, seeking divine support for their political ventures. But however devout, none would have even thought of ordering an entire flight to go vegetarian to suit his/her needs. These leaders may have been corrupted by power – but not to the point of regarding the state as their private property. The Rajapaksas do, which is why a commercial flight was forced to go vegetarian. It is a telling indication of the future awaiting us if they win. Since the Rajapaksas equate themselves with the country, their electoral needs become national needs; consequently the use of state power/resources in their election campaign becomes the normal and obvious thing to do, from their perspective. Last week Gotabaya Rajapaksa claimed that retired military officers have a right to participate in his brother’s election campaign. He is right. Retired military officials have a right to engage in electioneering. But serving senior public officials, particularly permanent secretaries to government ministries, do not. This week Gotabhaya Rajapaksa claimed that previous presidents did things contrary to good governance. He is right. Quite a few of the problems we face today are the accumulated results of decades of wrong-doing. But where did Mr. Rajapaksa make this statement? In Homagama, while opening an election-campaign office for his brother! It is now beyond doubt that 1,000+ CTB buses, from all over the country, were used to transport crowds to Mahinda Rajapaksa’s inaugural meeting in Anuradhapura. It is logical to assume that similar gimmicks are being used to create optical illusions of success at other meetings. Once again the huge cost – and the inconvenience, especially to OL students dependent on public transport[ii] – will have to be borne by the Lankan people. Election violence is obviously on the rise. During a twenty-four hour period, three opposition meetings were attacked. Some of the attackers had come in defender jeeps, the trademark vehicle of regime-mandated thugs during the Uva campaign. [iii] President Rajapaksa has ordered an immediate investigation – his favourite ploy, to deflect blame and evade responsibility. 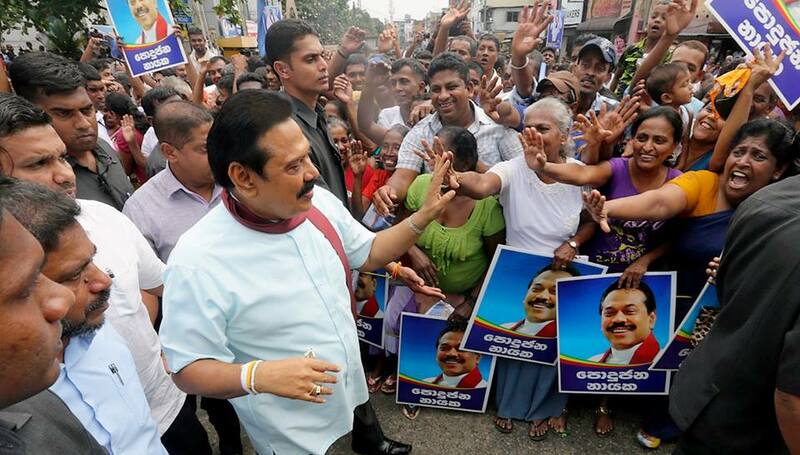 Another disturbing first is the reported use of the military to promote Candidate Rajapaksa. In Galle, the Army had been carrying out programmes in tuition classes to ‘inform students about the war-victory’. A Deputy Election Commissioner has ordered this practice to be stopped. According to the report in Lankadeepa, the army officer in charge had claimed that the programme is not electioneering but part of an army recruitment drive[iv]. If guns, goons and gods do not suffice, the Rajapaksas will turn to racism. This week the President himself accused the Opposition of having a deal with the TNA. “We are watching these things carefully. These things need to be revealed.”[v] Why cannot the Opposition – or the UPFA for that matter – have an election pact with the TNA? The TNA is not an illegal entity or a clandestine terror outfit. It is a legal political party functioning openly and peacefully in the democratic mainstream. But then, for the President every Tamil is somehow a Tiger, unless they support him, in which case they become miraculously transformed into patriots. So Jeyakumari Balendran is still under arrest for trying to discover the fate of her vanished son while Vellupillai Pirapaharan’s handpicked-successor, Kumaran Pathmanathan alias KP is a totally free man. There are also indications that the Rajapaksas may be readying to use their Sinhala-Buddhist supremacist proxies to incite Muslim-phobia in the South. The BBS is once again talking about Jihadists in the East; at a recent media conference Galagoda-Atte Gnanasara Thera claimed that “the government is in part ignoring some of the concerns as a result of attempts to win the support of the Sri Lanka Muslim Congress (SLMC) at the Presidential elections”[vi]. There are unconfirmed reports about a possible link up between Udaya Gammanpila and the BBS[vii]. Inciting racist fires or staging ‘terrorist attacks’, can well become election-winning gimmicks of last resort. The Rajapaksas will try to steal the election, if they have to. But stealing an election is not quite an easy thing, especially at the national level. For instance, actual or paid supporters can be transported from place to place, to provide the illusion of hugely successful mass-meetings. But come election-day, supporters in sufficient numbers cannot be transported all over the country to engage in malpractices. A properly organised opposition, with polling agents and counting agents in place at every polling/counting centre, can do much to downsize rigging to negligible levels. There are some positive-firsts too, in the campaign. Perhaps in another first, in Dambulla, President Rajapaksa had to stop his speech and leave the stage in high-dudgeon, due to persistent heckling from some members of the crowd[ix]. Nothing in human history is inevitable. In Weimer Germany’s last democratic election, despite a campaign choking with violence and malpractices, the Nazis could win only 43.9% of the vote. Had the anti-Nazi parties contested as a united front, Hitler could have been defeated electorally. It is a lesson we must remember and learn from. Well, its clear he is not a follower of even the basic 5 precepts. Instead, he keeps squeezing some kind of primitive Hindoo ball in his hand. Hindoo balls do not give him power does it really? Its the goodwill of the people that gave him the opportunity to lead. The goodwill has gone up in smoke in a puff. The level of thieving by the family appears to be unprecedented. Its sad when one thinks about it. He has an interesting story that will appeal to a global audience. In the global market, his memoirs would fetch lets say $25 a pop. With 10 million copies sold would he would have made a cool USD $ 1.5 Billion. Add to that, he could have appeared in the lucrative lecture circuit milking it more and earning incredible goodwill as a world statesman. Instead the guy resorted to swindle like a Rs 2 whore and lost it all. This is what happens when you begin to believe in these primitive Hindoo mumbo jumbo rituals. Tisaranee you forgot Gota the Goebbels! It’s `Gooo`ta `Boo`ts and the Steel Pipe for the capture of the golden gun. Sure copy of ala,batala, manioc, and kassipu with opium lined. In the footsteps of Sirimavo- there is no Russia nowadays No?? Gods notwithstanding, yhis is what JVP leader Anura Kumara Dissanayake was saying at Piliyandala… through the grapewine..
PS. If Medamulana MaRa stays on for another 2 years, won’t those 2 years of presidency come out of Mr. Matripala Sirisena? Medamulana MaRa wants to bribe the Gods, just like his Shills and Cronies, but the Gods won’t take his offerings and the Gods won’t grant him favors on the 8th of January, 2015 to be re-elected. TG, Any progress on the Common sense Phamplet, Sri Lanka, 2014? Amarasiri is not aware of the saying “Whom the gods would destroy, they first make mad” – (Prometheus in Henry Wadsworth Longfellow’s poem “The Masque of Pandora”). This infidel coming from Sodom and Gonorrah is afflicted by this curse. He doesn’t know. Erich von Däniken – Chariots of the Gods? A little matter of arithmetic first. Even assuming your unit price for MR’s memoirs, and your estimate for numbers that could be sold, the total sales would be $250 million. Assuming a generous 10% royalty rate, MR would pocket only $25 million, which by now is peanuts for the Family. Regarding religious rituals, is tying multicolored cotton threads around the wrist after all night ceremonies chanting mumbo jumbo, or worshiping gnarled old trees in temple premises any less primitive? As a descendent of the superior anti-Hitler Jewish forces of Germany and Europe, can I please ask our history to be not denigrated by bringing us to this black vs. black fight. The background to our war, its victory or the methods we used will never be known by the wider world and they cannot be applied in your fight. We are waiting to see who wins and then we will rush in. Vibushana suffering from buyer’s remorse? Don’t feel bad Vibhusana -it is just that light has taken a while to reach you. Has he ever written any article? He has been blindly reiterating from the voice prompt! Thisaranee Gunasekara has profoundly articulated about Mahinda Rajapaksa regime. Gotabaya has terribly violated law and order but no one can argue about it. He is number one killer and murderer. It is very obvious and conspicuous in our society. Unfortunately our war heroes – brave soldiers are now transformed and diversified. Now Gotabaya is main campaigner for his brother though he is a secretary for the defence ministry. 1) They have engaged divine intervention with at least 3 Gods, Hindu, Christian and Buddhist. Islam had proved to be a bit tricky. 2) They have goons to disrupt the opposition. 3) They have primed their cohorts in the Supreme Court to declare Mahinda Rajapakse, in case the Oppositon wins, as entitled to continue as President until the end of his term in 2016. This election was to seek a further 6 year term. 4) In the event, against all odds, Mahinda Rajapakse wins, the Supreme Court will declare that the new term will begin in 2016 for another 6 years. In the next 8 years of dictatorial rule, Mahinda Rajapakse will have plugged all the loopholes and will continue forever, reminiscent of Hitler and his Enabling Laws that legitimately provided him carte blanche to commit genocide. Thank God for that Titsaranee. We have seen the abilities of “Mithree since he unwisely submitted himself to be the proxy of Ranil and Chandrika. good that he will disappear from the seen by the second week January 2015. He is a dud! We need more efficient people like Gota in politics and bureaucracy to develop our country. Compare the MY3s and MRs speeches these days. MY3 on top, MR goes back on defence to defending his family corruption and ends up directly admitting those corruption. We need Gota like we need [Edited out]. Ruthless dictators can rule any country and be powerful only as long as the dictatorship lasts. Sooner or later they all come to a sticky end. We have had Hitler, Stalin, Pol Pot, Idi Amin, Ceaucescu, Milosevic and more. Where are they now? Before Javi, Amarasiri or Navin Titsaranee, let me say this. You have done it agan! Another excellent article. Thank you. Please translate it in to Sinhala and publish more widely so that our illiterate stupid voters can come to their senses. Please do it to me one more time, every week. The Sinhala Subtitles are the Modern MaRa version of MaRa going berserk after losing on January 9, 2015. What Hitler said in 1945 in German,and what MaRa is expected to say in Sinhala and with English Subtitles is given below. If you have time, or your friends have time, a Tamil Subtitle and English Subtitle video should be produced and widely distributed. I have translated to English the Sinhala Subtitles. You do for Tamil and distribute. Enjoy! The Assistant Speaks: Sir, the current election results are not in favor of us.. There was no change even with the Fraudulent votes..
Uva, West, North and Eastern Provinces have an unfavorable situation.. The Assistant Speaks: Sir,.. Hambantota, We have lost Hambantota as well , Sir. The Results just came in.. The Assistant Speaks: You could have disclosed those Files.. The Assistant Speaks: We don’t know if this was an international conspiracy, Sir. But the Elite , Anglicans and the Vellalas are getting cold feet , according to my intelligence from the Elite Turf. Even if Sira wins , Ranil is not going to get even the Ordinary PM title let alone the Exec version. It will shaft cousin Ranil big time. Last tome the ex Prez had to depend on JVP. This time she has Sobitha and Rathna as well to fix Ranil and his whole kaboodle..
Sira is no Fonny for sure. And she is dead set about making it happen. Can you remember a song called Nondi Sira? So you have stopped referring to Your Three. Did you find them infested with body lies (gopai)? Donkey Sinhalayas are far from facts and figures. They just believe what Rajapakshes media unit spread about Ranil and all other allies got together to clear the mess in the country today. Can anybody bring any high corrupted issue against Ranil or Maithreepala ? Sure the rumours make it worse in this country than any other civilized world. It just spread as wild fire woudl burn thousands of hectares within seconds. People are though said to be literate – their grasphing nature seems to be not far from illiterates. This has been a common problem for entire developing nations. This election isthe only chance for Sinhalaese, Muslims, Tamils and other minorities to keep more hopes. They must vote for a change – then only we could corner the man who looted the nation – though failed once but this time for sure. It will be interesting what will be on the menu for the flight that Rajapaksas have planned on 9th on a Mihin Air plane for either to China or African Banana republic? Long live freedom and democracy in Sri Lanka – days are counted on Rajapaksa regime and the numbers are too small ! Damn good lesson for the Buddhists HYPOCRITES of this country to have allowed a self made criminal like this to elevate himself to the highest thrown. The Western imperialists of the Christian Church and other religions that salivate in proselytizing our people and thereby, polarized the country and affect the vote base in representation between ethno-religious lines, would like our criminal leaders to stay as long as they wishes, so that Buddhism itself can be killed, softly. Useless Gods. They are indifferent, we created them, if not for us, they are ” Zero “. Rajapaksa can’t live without the Archaic Hindu Gods, yet hammer the Hindu Worshiping Tamil People. To my Tamil Brothers and Sisters, please vote, spoil your vote if you must, pls do vote. Why do the president and other politicians pray at hindu, rather than muslim and christian shrines for political advancement and survival is puzzling. Most are followers of the Buddha who told them to follow the Noble Eightfold path which they find tough to comply with, and ‘practise’ politics too, at the same time – most probably. Maybe because only hindu shrine authorities accept cash and gold, and this gives a sense of ‘have paid, and hence the goods will surely be supplied’ feeling predominates. But there is one hi-fi Buddhist temple which charges entrance fees. Didn’t you know? Vegetarianism is a good idea, even for a short while. But, when a mass killer is a vegetarian just for kidding God, the question is whether it will work. For many, the election will be about the credibility of the Temple that the Killer went to. We will know soon enough. It goes to show that Mahintha has no trust in Lord Buddha or should I say he knows that Lord Buddha has no trust in him. The Question is why didnt he go to Mahabodhi but went to Thirupathi. He must have thought that he could lie under oath in Thirupathi. But for his bad luck it was the Bathrakali Amman he worshiped that day. 145 innocent school children were gunned down by the Terrorists in Peshawar in Pakistan. Because these kids went to a Public Central School run by the Army. Blood soaked floor of the class rooms, innocent mums and dads weeping at their un imaginable losses broke my heart, and brought back memories of similar incidents in my motherland. Will our poor innocent inhabitants face a similar future again?.. The unholy alliance is not short of people, some of whom who have had associations with terrorist activities . Are you talking about arantalawa, kumudini boat tragedy, 15 childen murder in trico or innumerable rapes in north east? your brethren from north and south can be an easy match to peshawar balu sena. the mass killer who ordered the Aranthalawa is a deputy leader of the SLFP formed by the great SWRD and this hows what low the country have gone with the Medamulana rogues. Athal Sumane – how about the Colonel Karuna about – a vellala or christian ? “Moda Gon Mahindaya” sung by library staff when there was a library attendant by the name of Mahinda. T.G. – you have missed another first in this electioneering – H.E. be kept secret until the PE is over?? I plead that it is very necessary to agitate against the ECs self-proclaimed rule that the Declaration of Assets will be his secret, as they are sealed for this reason and made available after the elections. about its disclosure? This simple and elementary tactic should be worth the while. The ball is now in MRs court. Another great analysis by Tisaranee. Yes. Rajapakses can fool God’s and the public at the same time. In the morning President can be a Vegetarian and in the evening he can vandalize and burn opposition party’s stages, trucks, sound equipment and hurt their party supporters. If anyone thinks that Rajapakses will go peacefully after loosing the election is a joke. They will use all the available tricks on earth to stay in power including False flag Genocidal riots of any sort to disrupt the country. Election Commissioner…..MACO is a joke. Nobody should trust him and the police during elections. These are the jokers who even cannot remove illegal Rajapakse cut outs and posters. How can one trust them to carry out fair elections. It’s a joke. It’s time to call in for UN, CW, SAARC and NA troops as well as supervisors to both supervise the elections and for protection of opposition candidates and their supporters and to avoid another 1983 like False Flag Genocidal progrom. 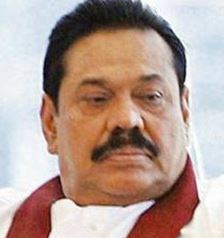 It is the Greed, Absolute power, Selfishness and False pride that brought down Rajapakse Dynasty. Maithreepala and others should be aware of this.